25-year-old RHP Luke “Dream” Weaver debuts for the D-Backs in this day game, while 24-year-old RHP Walker Buehler does so for the Dodgers. Weaver came up with the Cardinals in 2016 and has a record of 15-17 with a 4.79 ERA in 233 career innings since then, including a 7-11, 4.95 ERA record last season. He came to Arizona in the Paul Goldschmidt trade last winter. Buehler came up with the Dodgers in 2017 and has compiled a 9-5, 2.95 ERA in 146 career innings since then. Buehler had a somewhat abbreviated spring training while saying his arm didn’t “feel right,” so it’s unclear how fully ready he is. 1948 At Ebbets Field No. 2, the Dodgers play their first exhibition game at Dodgertown in Vero Beach, which will remain the team’s home for 61 years. Amidst much fanfare, including Governor Millard Caldwell throwing the ceremonial first pitch, Jackie Robinson homers in the first inning as Brooklyn beats its top farm club, the Montreal Royals, 5-4. 2018 Red Sox shortstop Xander Bogaerts, who goes 3-for-4 in the team’s 3-2 victory over the Rays at Tropicana Field, becomes the first American Leaguer to have multiple extra-base hits in the first three games of the season. In 2015, Dodgers first baseman Adrian Gonzalez also accomplished the feat, collecting at least two hits in each of LA’s first three contests when he compiled ten hits his first 14 at-bats of the season. The visiting Sox send RHP Rick Porcello (17-7, 4.28 ERA) to the Dodger Stadium mound to face the Dodgers’ RHP Walker Buehler (8=5, 2.62 ERA). Porcello has made several relief appearances in this postseason as well as two starts, and he’s 1-0 with a 4.22 ERA. Buehler is 0-1 with a 3.86 ERA in his three starts this postseason. He started Game Seven of the NLCS and gave up one run on a homer by Yelich in the 4 2/3 innings he worked. Which Dodgers are hitting well in the postseason and which are not? 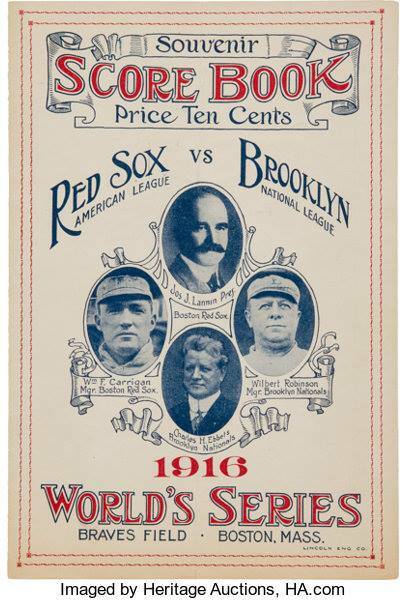 …37 percent of the 38 teams to return home down 0-2 in a World Series battled back to tie the Series by Game 4. That doesn’t mean the odds are in L.A.’s favor, but the history is more favorable than you might expect. This will be the third time this postseason Buehler has started “the most important game” for his team. 1934 While Washington Senators player-manager Joe Cronin honeymoons with Mildred Robertson, owner Clark Griffith’s niece and adopted daughter, he is sold to Red Sox. 2004 Pedro Martinez, Mike Timlin and Keith Foulke combine on a four-hitter to lead the Red Sox to a 4-1 victory in Game Three of the World Series. Today in Dodgers’ history: They’ve never played a game on October 26 until this year. I love the whole concept of Game Seven unless my team is in it. The Dodgers ask RHP Walker Buehler and the entire pitching staff to save their World Series hopes for them. Buehler had a great outing in the tiebreaker game against the Rockies but has struggled in his NLDS and NLCS appearances thus far, giving up nine runs in 12 innings of work in those two series. He’ll face RHP Jhoulys Chacín, who’s thrown 10 1/3 scoreless innings in his NLDS and NLCS appearances. Four keys to the game, according to MLB correspondents. 1988 The Dodgers become World Champions when Orel Hershiser limits the opposition to four singles in Game 5 of the World Series and beats the A’s, 5-1. The right-hander, who also won Game 2, is named the Most Valuable Player of the Fall Classic. 1994 Receiving all 28 first place votes, Raul Mondesi (.306, 16, 56) is named the National League’s Rookie of the Year. The Los Angeles rightfielder, who easily outdistanced Astros’ hurler John Hudek and Braves’ outfielder Ryan Klesko, is the third consecutive Dodger to win the award. 2010 Ted Lilly signs a three-year, $33 million deal to remain with the Dodgers. The 34 year-old southpaw, obtained from the Cubs in early August, compiled a 7-4 record with a 3.52 ERA in 12 starts for LA, including victories in the first five starts for his new team. 1982	On his 29th birthday, Keith Hernandez hits a game-tying two-run single off Bob McClure in Game 7 of the Fall Classic, in the Redbirds’ eventual 6-3 victory over the Brewers at Busch Stadium. The batter and pitcher, who lived in homes 100 feet from one another growing up in Pacifica, California, were teammates in Little League and Terra Nova High School baseball team. 1982	The Brewers, playing in their first World Series, are unable to hold on to a 3-1 lead in Game 7 when the Cardinals beat Milwaukee, 6-3 with the help of Hernandez’s sixth-inning single. It’s the Redbirds’ first world championship since 1967. 2009 The Brewers hire Rick Peterson as their pitching coach to improve the club’s woeful starting pitching, which posted a 5.37 ERA last season. The 54 year-old pitching guru, known for his focus on motion analysis, is reunited with bench coach Willie Randolph and skipper Ken Macha, who were his former managers with the Mets and the A’s, teams he toiled for in a similar role.